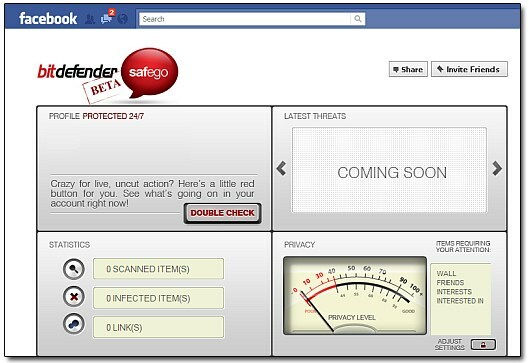 This is a first look at Bitdefender SafeGo a new free antivirus for Facebook. SafeGo automatically scans all wall posts, news feeds, and messages (email support is apparently coming soon) for malicious links that may contain malware or spam. The program leverages Bitdefenderâ€™s cloud scanning to match links against a whitelist and blacklist. SafeGo even has a privacy configuration utility that allows one to make their Facebook account more secure. The program comes to market as Facebook spam and viruses are on the rise and is the first true social antivirus. 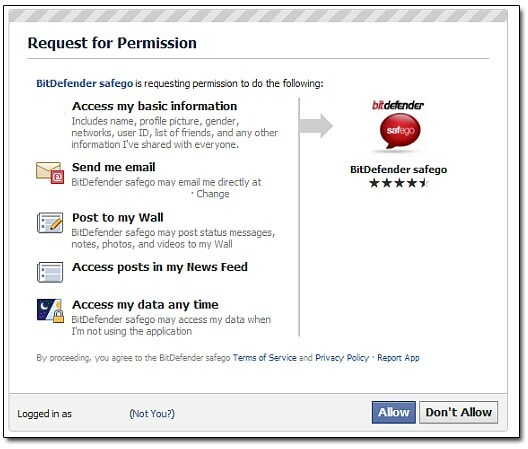 The installation of Bitdefender SafeGo was easy. Simply head over to the Facebook app page and click continue. The only downside to SafeGo is that it needs access to everything that it can protect. Therefore one will have to allow it to view messages, wall posts, etc. to provide the protection. This is kind of the downside to the program as one actually has to give up some security to gain some. Bitdefender SafeGo is completely automatic. The app automatically scans all areas of Facebook and even checks friends news feeds and wall posts for viruses. The dashboard displays how many things have been scanned, infected, or if it found any malicious links. Settings are kind of sparce. There is the scan my inbox (not yet available), publish to the wall if a file is detected, and publish a weekly summary. I think the best part about the program is the privacy meter. I started out with a poor setting or zero. The adjust settings button simply takes one over to the Facebook privacy controls. Whatâ€™s nice is that the meter brings to ones attention problems and probably should be used by Facebook as a whole. However, I would have preferred an auto configuration option. Bitdefender SafeGo didnâ€™t really scan any items within about 2 hours of using it. However, this is expected since I seldom use Facebook. However, the program has a four and half star review from some 42,000 users. So even though some of the features are disabled (SafeGo is still technically in beta) it is definitely a step in the right direction. I recommend using this program in conjunction with a free antivirus on the same computer for comprehensive protection.